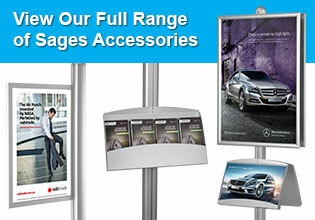 The A1 poster frame or snap frame is an integral part of our modular sages display system. The functional and stylish construction will complement your promotional graphics and draw attention to your advertising messages. Finished in silver anodized aluminium and weighing in at only 1.7 kg means that as well as being stylish and refined our A1 snap frame is also light and easy to assemble. Being part of the Sages Series modular system allows you versatility and flexibility when building a marketing display system. 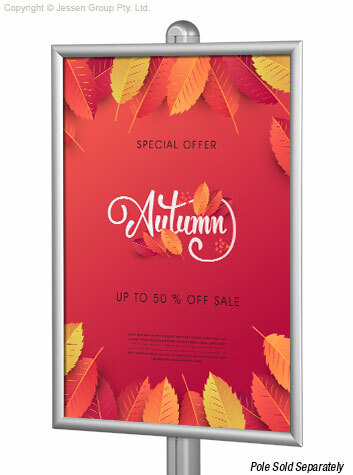 Why not try using four A1 snap frames mounted double sided, two on each side of the stand, giving you the maximum advertising impact possible while maintaining the flexibility of a portable display. Another effective format is one A1 snap frame paired with our large format literature holder. That's the beauty of the Sages Modular System, you can build a personalised marketing system quickly and easily. All our poster frames use Slimline Warehouse's ingenious snap frame system, graphic changes are quick and easy taking just 60 seconds while a clear lens in each of your frames keeps poster clean and laying flat in the frame. The Sages Series is a modular system that can be used with a wide range of other accessories such as: assorted poster sizes, brochure holders, printed banners and shelving configurations. The European styled stand can be easily manoeuvred around you premises to suit your needs and the range of accessories available provides versatile presentation of your graphics and advertising material. Constructed from quality aluminium our poster frames and other accessories are shipped unassembled in order to keep your shipping overheads to a minimum. They are also suppled with a straight forward assembly instruction sheet with all fasteners required to get your display sign assembled and ready to go within minutes.